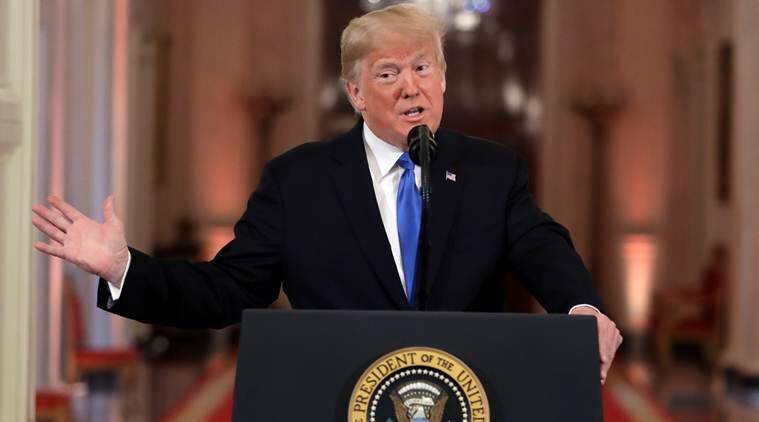 For doing so, President Donald Trump is using his authority to suspend or restrict entry of aliens into the US if he determines it to be in the national interest to do so. In another controversial move, the Trump administration has decided to restrict the entry of illegal migrants who cross the southern border with Mexico to seek asylum in the US. The move, opposed by several right groups, is at preventing the several thousands of people, mainly from three Latin American countries – Honduras, Guatemala and El Salvador – from entering the country and using the existing asylum law to gain entry into the United States. The Justice Department and Department of Homeland Security published a joint rule on Thursday prohibiting certain people caught crossing the US southern border from Mexico between ports of entry from claiming asylum. Once the plan goes into full effect, migrants entering at the US southern border would only be eligible for asylum if they report at official ports of entry, officials said. For doing so, President Donald Trump is using his authority to suspend or restrict entry of aliens into the US if he determines it to be in the national interest to do so. “Our asylum system is overwhelmed with too many meritless asylum claims from aliens who place a tremendous burden on our resources, preventing us from being able to expeditiously grant asylum to those who truly deserve it,” Acting Attorney General Matthew Whitaker and Department of Homeland Security Secretary Kirstjen Nielsen said in a joint statement. The president is also expected to sign an accompanying directive specifying which migrants would be subject to the new asylum limits, senior administration officials said. The officials did not say to whom the ban would apply. President Trump made his hard-line policies toward immigration a key issue ahead of Tuesday’s midterm elections. The announcement on Thursday suggests he will not ease up on his immigration crackdown, which dominated his first two years in office. “Today, we are using the authority granted to us by Congress to bar aliens who violate a Presidential suspension of entry or other restriction from asylum eligibility,” they said. “The interim rule, if applied to a hypothetical proclamation suspending the entry of aliens who cross the border unlawfully, would bar them eligibility for asylum, and thereby channel inadmissible aliens to ports of entry where they would processed in a controlled, orderly and lawful manner,” a senior administration official told reporters during a conference call. House Democratic Whip Steny Hoyer described the latest move as “inhumane” and as part of Trump’s ill-conceived asylum policies. “Imposing illegal restrictions on refugees seeking asylum through the proper channels according to US law runs counter to our principles as a nation and represents a gross overreach of presidential power,” he said. “Upending our asylum process and rejecting people – who have travelled thousands of miles to escape violence and death – from even seeking asylum at the border is not only immoral, it’s illegal,” said Steven Choi, executive director of the New York Immigration Coalition. The statute, section 212(f) of the Immigration and Nationality Act, which governs the US immigration system, states that the president can suspend entry of foreigners deemed “detrimental to the interests of the United States.” The Department of Justice and Department of Homeland Security said new rule applies to prospective presidential proclamations, and is not retroactive. In a conference call with reporters, a senior administration official said that in the fiscal year 2018, the US encountered 600,000 inadmissible aliens. Of those, 400,000 attempted to enter illegally. “Almost all of those who attempted to enter illegally entered on the Southwest Border,” the official said. It is the same border through which the caravan is expected to enter the US. Trump has deployed several thousand military to stop them from entering the US illegally. Under the current process if an alien is apprehended after crossing across the border unlawfully, after apprehension and initial processing they are taken under US Customs and Border Protection. If they express an intent or, express a fear of return, they are referred for an interview with the US Citizenship and Immigration Services asylum officer. “Although there may be a number of people seeking to come here claiming asylum, history’s statistics have shown the number who are actually qualified for asylum is a much, much lower number, and in the case for many of these countries, less than 10 per cent,” the official said in response to a question. “Our objective is to have a process that works quickly and efficiently so that those people who actually qualify for an asylum claim are able to have that determination made so that they can then begin their life under the protections granted by the US Government,” the official said. In the last five years, there has been a 2,000 per cent increase in aliens claiming credible fear once placed into expedited removal. As a result, credible fear interview has increased from 5,000 in 2008 to 97,000 in 2018. Presently, the US asylum rules do not bar people who enter the country without authorisation, and the Immigration and Nationality Act, specifically allows people who arrive in the US, whether or not they do so at a designated port of entry, to apply for asylum.